13. Chicago White Sox: Brandon Workman – RHP – Texas. R-R – 6’5″ 220. 8.13.88. I think Workman will be there and I still think the White Sox will take him. Wojciechowski, Arkansas RHP/OF Brett Eibner and Virginia Tech RHP Jesse Hahn are also options. (5.21 Brandon Workman). 14. Milwaukee Brewers: Matt Harvey – RHP – University of North Carolina. R-R – 6’4″ 225. 3.27.89. Boras Corp will get top dollar for a guy tabbed as the top prospect in this 2010 class three years ago, who looked like a 3rd rounder his first two years in college until reinvigorating his elite status this spring. (5.21 Brett Eibner). 23. Florida Marlins: Brett Eibner – RHP/OF – Arkansas. R-R – 6’4″ 210. 12.2.88. I’m now thinking college arm. Arizona State RHP Seth Blair, and Texas A&M RHP Barret Loux are also possibilities. (5.21 Dylan Covey). 32. New York Yankees: Zach Lee -RHP – McKinney HS, TX. R-L – 6’1″ 180. 12.17.91. The Yankees have been heavily linked to prep Texas RHP Tyrell Jenkins and Michigan OF Ryan LaMarre. I still like them to take a stab at signing two sport star Lee and trying to sign him away from his LSU football scholarship. (5.21 Zach Lee). MLB Draft Prospect: Kolbrin Vitek – 2B/RHP – Ball State University. 6’3 195. Jr. DOB: 4/1/89. HITTING – Although this is probably his most advanced tool, Vitek would not be getting the attention he is if he were in the unusually deep 2008 college position player draft class. It’s the lack of impact bats in this particular draft class that makes Vitek’s hit tool stand out. In the small sample that I witnessed, Vitek pulled a fastball on the inside half on a hard line out to left field and later in the game hit a double off the right field wall on a strike up and on the outside half displaying the easy yet surprisingly uncommon ability to hit the ball where it’s pitched. POWER – Vitek’s power projects as merely average despite hitting 28 HR over the past two seasons. The double referenced above displayed his bat speed and forearm strength. SPEED – As you can see in the video above, I had Vitek at 4.2 seconds from home to first base on a groundout to the shortstop, which is above average from the right side of the plate. ARM – A pitcher on in the weekend rotation, Vitek has been clocked at 92 hence his arm should play as a plus at any position. DEFENSE – As a Sophomore in 2009, Vitek played third base before shifting to second base this season in an attempt to rest his arm when not pitching. He projects to move back to the hot corner as a professional where he should be an average defender. The first step quickness appears adequate to me to handle third base, but the club that selects him will need to be patient with him as he adjusts to the position as a professional. Some clubs see him as more of a outfielder and he has the athletic ability to play there. 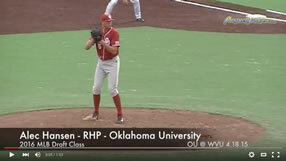 FUTURE – While Vitek is one of the best two-way players in College Baseball this season and was recently named the Mid-American Conference West Division “MAC” pitcher of the week, there is little doubt that his future is as a position player. While probably an unfair speculation on my part because he plays for a small conference, I think Vitek will be an easy sign. That factor, combined with him being one of the more advanced bats in the draft make him a safe bet to go in the mid to late portion of the first round. While I don’t think he’ll ever be a star in the League, his above average collection tools combined with his advanced bat make him a safe bet to reach the major leagues and contribute as an everyday player.